Coffin tank? Tick. Yellow paint with speed block decals? Tick. 400cc air-cooled two-stroke engine? Tick. Where do we sign up? The Yamaha RD400 was a larger capacity successor to the immensely popular RD350 and represented Yamaha’s rather late entry to the 400cc class. Yamaha used the capacity increase to increase the torque, rather than the power, meaning a much more useable engine in real world conditions. But don’t for any minute think that it was slow. At the time, Bike Magazine described its acceleration curve from 5000rpm as "little short of frightening". 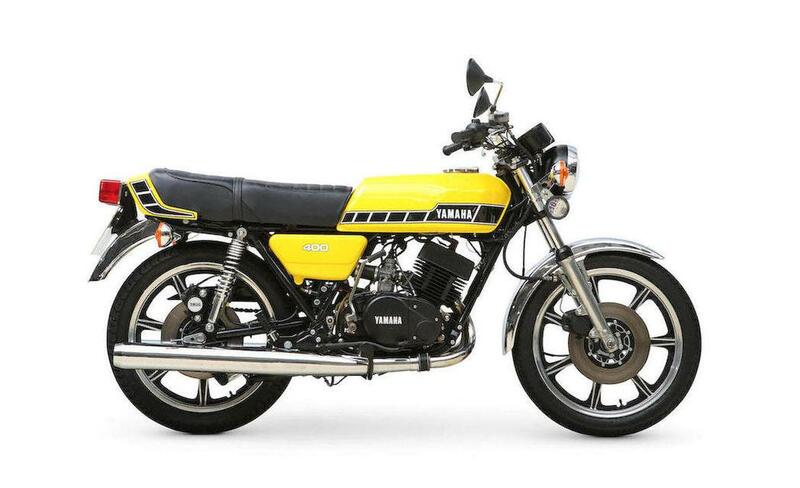 The Yamaha, with its cast alloy wheels, opposed piston front brake and incredible acceleration made competitors such as the Honda CB400F look fuddy-duddy by comparison. "A desirable early RD400 with opposed-piston front brake (the sliding-calliper brake on later models is poor by comparison), this example was last taxed to 31st October 2013. "The machine is offered with a V5C Registration Certificate, copies of previous V5Cs, and a quantity of MoTs (most recent expired August 2015)."